Don Michael Swartzentruber [swärt zen trü ber: pronounced phonetically] (b. 1966 Seaford, Delaware) designs carnivalesque images that manifest from interests in theology, cultural issues, and the surreal. He has taught and lectured on the arts for the past sixteen years. He received an M.F.A in Visual Art from Vermont College of Norwich University and exhibits nationally. The recipient of numerous grants and awards for his instruction and studio practice, he has served as Adjunct Professor at Indiana University-Purdue University Fort Wayne and Grace College. His is also a tenured secondary visual art instructor at Warsaw Schools. 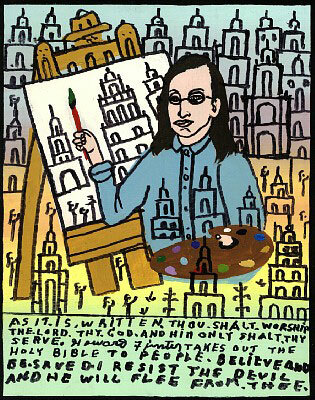 He creates his enigmatic iconography in the historical Billy Sunday community of Winona Lake, where he resides with his wife and two sons. "Welcome to the weird" could be the theme of the most recent LAC exhibit. What's weird-Don Swartzentruber of Winona Lake calls his style pop-surreal-are the images the painter presents for inspection. The artist is used to the term "weird" as well as "strange" and "disturbing" and other words used to describe things that just aren't normal. On exhibit is a very personal, autobiographical show. Swartzentruber uses religious, cultural and sexual icons in a straight-forward manner to present his thoughts on these issues…Titles include, Maternal Sin, Carnal Casino, and Estrogen…Using ancient and modern symbols, the exhibit stirs up emotions-the ones locked in the belly. In the detailed-filled works, several stories are being told-like a strange conversation. They're surreal, remember. On the other side of the entrance, Swartzentruber tackles the theme of marriage and puts color to the canvases in the "Heterosexual Monogamy" series. "This became an opportunity to explore the mystical, passionate and violent process of two individuals becoming one", he said. In Organically Entwined, a couple is wrapped around and growing together like a lush vine. The only indication something is amiss is the pinched expression on one forest green face. Another work, Flesh of One Flesh two figures face each other with huge open mouths-the better to obsess over and consume one another…The exhibit is one of the most interesting presented by the LAC in a while. It may also be one of the most controversial…It's easy to leave a still-life of flowers behind. Swartzentruber's paintings hover after the viewer who is then left to ascertain these themes alone…Swartzentruber swears he's conservative in his thinking. However. He is explicit in his drawings. Figures dance, twist and gaze out of their settings colored with purple, green and orange skin. Thy may sit on the head of or in the mouth of another creature. …Paint oozes past the usual boundaries just to created new borders…This is where he exorcises his personal demons. Some of the devils are quite apparent. Others are hidden in shadows or shadowed in humor. It's all a sight to see."